Energy security has become the main issue for Indonesia Government because Indonesia is targeted to be independent in energy field.To reach the goals NRE usage, there should be cooperations amongst all party : government, society, academicians as well as corporates. Virtual Learning Environment (VLE) is a powerful application to deliver knowledge in the digital age while contributes to educate society about New and Renewable Energy (NRE). However, user requirements are needed before developing VLE to reveal existing conditions and understand the users’ behaviour. This paper purposes to understand the user requirements, who are university students, to contribute to NRE project. Research methods used are interview, observation and questionnaire. Interview was conducted with Lentera Bumi Nusantara who develops NRE technology especially wind turbine in Indonesia. Observation was done in Lentera Bumi Nusantara’s office and questionnaire was distributed amongst 92 students in Universitas Pertamina, Jakarta, Indonesia. The results show that university students are human resources needed in NRE project. Then, learning materials regarding how to build blade and wind turbine have not distributed to others. Furthermore, results show that 84% of university students are ready to contribute in NRE project. However, only 37% of university students own original idea for NRE project related to their academic background. To build the VLE to support NRE projects, there should be menu for university students to discuss online so they can share ideas regarding NRE and menu for contributing to NRE project in Indonesia. MANTORO, A., Setiawan, A.A. and Wilopo, E.W., 2017. Proyeksi Konsumsi Energi Listrik 2016 Sampai 2035 Dan Rencana Pemenuhan Energi Listrik Berbasis Energi Baru Terbarukan Di Kabupaten Manokwari (Doctoral dissertation, Universitas Gadjah Mada). SUHAEMI, T., 2014, November. Partisipasi Masyarakat Dalam Pembangunan Pembangkit Listrik Tenaga nuklir di Indonesia. Seminar Nasional Pendidikan Sains IV 2014. Sebelas Maret University. MAHULAE, P.J. dan HUSNI, N., 2017. Implementasi Kebijakan Pemanfaatan Energi Baru Terbarukan (Ebt) Dalam Pemenuhan Kebutuhan Listrik Di Desa-Desa Terpencil Di Sumatera Utara (Implementation Of Renewable Energy Utilization Policies In Fulfillment Of Electricity Needs At Isolated Villages). 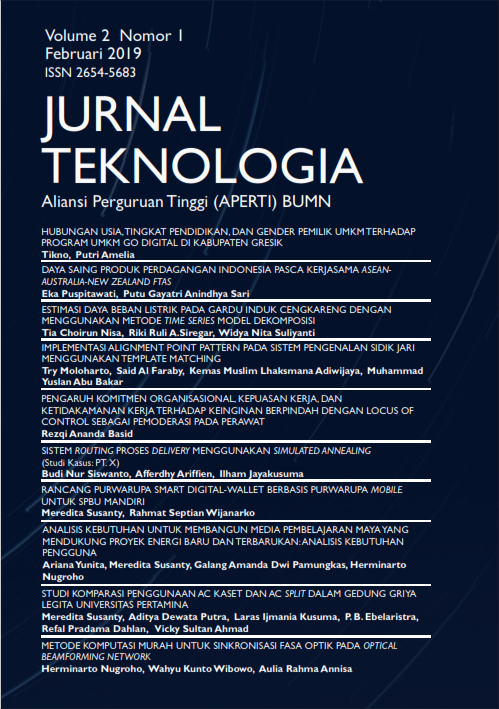 Open Journal System Balitbang Provsu, 14(1), pp.61-76. PRASTOWO, B., 2015. Potensi sektor pertanian sebagai penghasil dan pengguna energi terbarukan. Perspektif, 6(2), pp.85-93. MISBACHUDIN, M., SUBANG, D., WIDAGDO, T. and YUNUS, M., 2016. Perancangan Pembangkit Listrik Tenaga Mikro Hidro Di Desa Kayuni Kabupaten Fakfak Provinsi Papua Barat. AUSTENIT, 8(2). JATI, W.R., 2015. Bonus Demografi Sebagai Mesin Pertumbuhan Ekonomi: Jendela Peluang Atau Jendela Bencana Di Indonesia. Jurnal Populas, 23(1), pp.1-19. KADAR, M., 2016, September. Smart learning environment for the development of Smart City applications. In Intelligent Systems (IS), 2016 IEEE 8th International Conference on (pp. 59-64). IEEE. ZAHARIAS, P. dan POYLYMENAKOU, A., 2009. Developing a usability evaluation method for e-learning applications: Beyond functional usability. Intl. Journal of Human–Computer Interaction, 25(1), pp.75-98. SIMARMATA, JANER. 2009. Rekayasa Perangkat Lunak, Yogyakarta: Penerbit Andi. ROBERTSON, S. dan ROBERTSON, J., 2012. Mastering the requirements process: Getting requirements right: Addison-wesley. PREECE, J., ROGERS, Y. dan SHARP, H., 2015. Interaction design: beyond human-computer interaction. John Wiley & Sons.